Superman comes upon Kristen Wells, noting her exotic garden. He starts to politely introduce himself, and she punches him to Tokyo. Superman returns to find Wells armed with a gun, threatening him. He says he's there to talk, and she stands down. She explains that she was a soldier under Admiral Dru-Zod until, generations ago, they decided to shut down the Kryptonian Empire. Refusing to yield, she and others fled. They were pursued by Almerac agents and the group split and fractured, some returning to Krypton, others going rogue. She eventually met Ro-Kul, fell in love, and perpetrated acts of piracy and events that included her killing other beings to survive. She recalls that in sojourn with Ro, she had dreams of Kandor, a proposed lunar colony. Later, on another planet, they are attacked by Amalak, a guy with designs on destroying all Kryptonians. Eventually he kills Ro, so she flees to Earth to use Superman as an early warning system, should Amalak return. Which he does the minute she finishes her story, after brief words from Superman about her not fleeing. 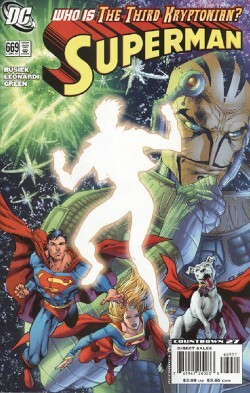 Story - 1: Most of the DC books seem to be suffering from Countdown's maladies. Be it a crummy tie-in, or, in this case, the writing. There are redundant dilemmas, un-enthralling peril, and bad wording choices, such as extrapolation through dialogue. This book doesn't have a ton of that, though it does have a good bit of it. That's the first thing that pulled me out and made me not enjoy it. The other thing is that I just can't find myself to give a damn for yet another Kryptonian, particularly when the ones we have are compelling and haven't been fully explored as characters, and when this one falls almost totally flat. Nuts and bolts, this story is flawed on several levels. The biggest eyesore is when the same dilemma is repeated twice (Karsta attacked by people with designs on killing Kryptonians in which several die and she survives, one and two), but there are others, such as the lack of any identity or care for Amalak promoted by no designs beyond "He has stuff that kills Kryptonians!" and "Everyone fears him!" in the dialogue (paraphrased, but yeah). So when he shows up, we don't really care. We're just like, "Oh. Nice Lobo looking hunk of nothing." There's also an attempt to show a little bit of Krypton, which is admirable, but it features systematic deviations from the previous Byrne Krypton without much justification in ways that complicate the story unnecessarily. I question this as a writing choice. Firstly, we haven't seen The Eradicator on New Earth, and yet we see Eradicator Squads, intended to pique interest, no doubt, but only confusing, and Zod's ship as the "Doomsday." Perhaps this is the beginning of an explanation of Doomsday and The Eradicator's origin in this continuity. I doubt it, and if so, I'm not made interested yet. As for Karsta as a character, she's hard to identify with or enjoy much as well. She's essentially a fighter for an evil Kryptonian Empire, she pillages her way across the universe, and then, when we first see her, she punches Superman to Tokyo despite knowing who he is and knowing that his intentions are benign. Well, that and he introduces himself politely. My guess is that this was for the cool factor of a punch to Tokyo. Problem is, that's happened a number of times, and it didn't fit the character, the situation, or the plot. It just killed space, particularly when Karsta then becomes instantly inapprehensive. The Deus Ex Machina of Amalak appearing after his description and just when Superman is starting to say, "Uh, hey, you killed people!" is just pitiful. I really, REALLY don't dig Krypton as an empire and Kryptonians spread out all over the universe. I really don't dig pulling away from Superman's uniqueness by diluting his origin as an orphan. I'm not saying I don't like Supergirl, Powergirl, or Krypto. I'm saying we don't have much need for more Kryptonians beyond that. Chris has fallen flat for me, Karsta isn't pushing any buttons, any good ones anyway, and now we have the potentiality for a ton more Kryptonians out there floating across the cosmos. Beyond that, there's always the obvious fifth grader question, "If they had a space empire, why didn't they leave the planet when it blew up?" Superman is the last son of Krypton, rocketed across space in a desperate experimental rocket to save his civilization's history and a scientist's only son. Supergirl is the last daughter of Krypton, because it isn't cool to have a patriarch uber-hero without a female counterpart in current society. Power Girl and Superman of Earth-2 are those of another universe, so they're coherent. Krypto is Supes' dog, not really a human, so he's kind of okay, so long as it doesn't go to horses and monkeys. The point being, we don't need more Kryptonians without a really compelling reason, and this issue is hardly that. "They're armed with us in mind, Karsta - and in an ORANGE SYSTEM, we're weak enough to be hurt!" Particularly when the scene doesn't need that info in order to work. "KANDOR? They were talking - there were plans to BUILD a lunar colony called that, on Wegthor." This is Karsta to a guy who's also FROM Krypton, and he left later than she did, if I read it correctly. Or at very least, he too was stellar navy. "In just two weeks ... our double-sized, blowout finale in which Karsta faces her sins, and a certain city goes bye-bye." If that happens in THIS story, I think I'm done with buying Busiek. As it is, I think I'm near that line right now, if not over it and just too dumb to realize I need to stop purchasing. As it is, I haven't really enjoyed much he's done with Superman, and I gave him plenty of chances to wow me in. More than almost any other artist I've seen on the character, given how cool he was to this site with the attempt to clear up continuity. But nice just doesn't equal a good story, period. Oh, and that part where Superman beats Karsta to death, I hated that. Ah, come on. Gotta inject some humor in here somewhere. Art - 3: It's a bit loose, and the paneling is stock and formulaic. That said, there are a few good moments, mostly the splashes. Still, to counter the splashes, there are a few confusing panels, or panels where continuity of form gets lost. It balances out. Not good, not bad. Just average, nothing sticks out. Cover Art - 4: It pays off the big reveal of Karsta, but that's not a big reveal to me, it fell flat, so it's hard to enjoy the cover for that. It also symbolically employs Auctioneer, which is cool next to the Zod ships, but it also includes Supergirl and Krypto, who weren't in the issue. That said, the drawings themselves are pretty impeccable, dragging it back up from the inconsistencies of its relation to the story, so I can't be too hard on it. Karsta kind of obscures the action a bit as a focal point, but it still generally works.